Tom Julin is a passionate believer in the First Amendment, which protects freedom of speech, freedom of the press, freedom to assemble peaceably, freedom of religious expression, and freedom to petition the government for redress of grievances. Throughout his career, Julin has represented journalists, newspapers, television stations and other clients in the media industry, helping to protect the freedom of the press. He has also been a powerful advocate for open government and the free flow of information, arguing against restrictive practices that inhibit the public’s right to know. Born in Chicago, Julin moved with his family to Ann Arbor, Michigan and then to Gainesville in 1971 his father Joseph was named dean of the University of Florida (UF) School of Law. After high school, Julin enrolled at UF and became editor of The Independent Florida Alligator, a student-run paper under independent ownership. It didn’t take long for Julin’s belief in freedom of the press to clash with the “closed door” policies of the university’s administration. The issue came to a head in 1978 when a reporter and photographer from the Alligator traveled across the state to cover an academic deans’ meeting in Marineland. “They were talking about measures for how UF would deal with the nation’s economic crisis, and I felt people had a right to know what they were doing,” says Julin. However, Julin and the two students were reprimanded by the UF administration for standing up for the freedom of the press. “Given such a hostile situation, Independent Alligator editor Tom Julin deserves credit for standing behind the position taken by his photographer and reporter,” wrote Robert Still, editor of Gainesville’s Evening Independent at the time. In a similar battle, Julin also argued that the university’s search for new deans should be open to the public – a position again opposed by the administration. Several years after Julin had earned his law degree and entered private practice, the case went to the Florida Supreme Court, which ruled in 1983 that dean searches were to be open to the public. 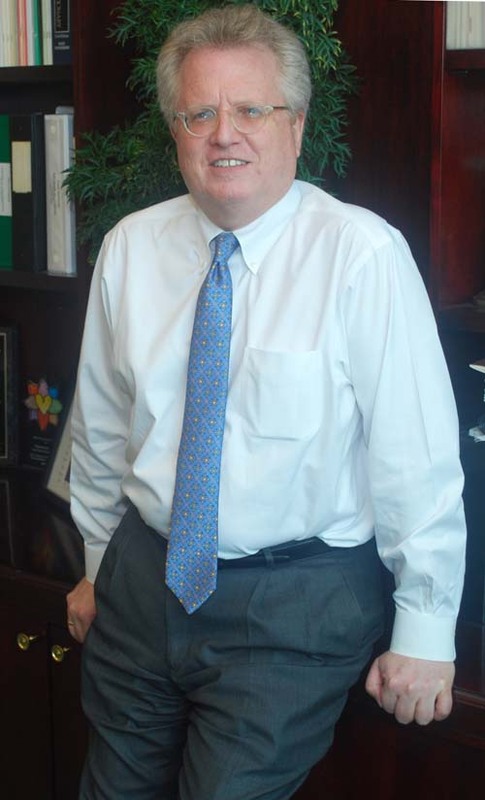 Since earning his law degree in 1981 and entering private practice, Julin has continued to represent the Alligator on a pro bono basis on various matters, including a recent proposal to remove the newspaper’s distribution boxes from the UF campus. He’s also provided legal guidance and support to online journalistic endeavors, such as the Broward Bulldog (now the Florida Bulldog), founded by former Miami Herald reporter Dan Christensen. As a young associate, Julin also defended media clients like the Palm Beach Post and Newsweek in libel cases. One high-profile suit was filed by a Palm Beach masseuse who provided house-to-house services and another came from a psychic who objected to a news story that she conducted séances with the dead in her bedroom. Julin also represented TV journalist Geraldo Rivera, who broadcast a story about corruption in the jai alai industry in the first episode of ABC’s “20/20” program. Rivera had suggested that the owner of the Palm Beach jai alai front had burned it down. The case ended in a summary judgment for the defendants. During the mid 1980s, Julin, D’Alemberte and Middlebrooks defended Post Newsweek stations in a $50 million libel claim filed by Southern Air Transport (SAT) against Channel 10. The Miami TV station broadcast a story from a woman, shown in silhouette to protect her security, who said she saw the crew of an SAT L-100 unloading rifles in Colombia and receiving bags of cocaine as payment. In defending the station, Julin sought to prove that SAT was owned by the CIA at the time of the incident, since the government is constitutionally prohibited from suing for libel. Although the results of his investigation didn’t make it into the courtroom, the jury ruled in his client’s favor after a six-week trial. More recently, Julin has defended a national news reporter subpoenaed to testify in a high-profile Texas criminal case, and won a case for the Animal Rights Foundation of Florida upholding its First Amendment right to protest on public streets against abuse of animals. When not busy with cases, Julin enjoys spending time with his wife Martiza and daughter Maren and their two grandchildren. He also finds time to read four daily papers every morning. As part of his practice, Julin provides legal advice concerning privacy, information access, data breaches and other information issues in today’s digital world. For instance, he represented IMS Health, a national company that collects data from pharmacies on the drugs that doctors prescribe. “A doctor in New Hampshire felt that collecting this aggregate data was an invasion of his privacy, and his wife, who was elected to the state legislature, introduced a bill that would prohibit pharmacies from selling prescription data to these companies,” Julin says. Julin recognized the case had First Amendment implications, since IMS was contacting sources for information, and reporting those findings to its subscribers. After the bill passed in New Hampshire, Hunton & Williams attorneys filed lawsuits against the attorney general, followed by similar suits against Vermont and Maine, which had passed similar laws. In 2011, the Vermont case (Sorrell v. IMS Health Inc.) went to the U.S. Supreme Court, which ruled 6-3 in IMS’s favor.